Mother’s Day is this coming weekend. Why not plan something outdoors to celebrate those special women in your life? Maybe your mom loves spending time in nature or maybe you want to share with her something you love! Either way, spending time together outdoors is a unique way to celebrate Mother’s Day that’s sure to create lasting memories for both of you. 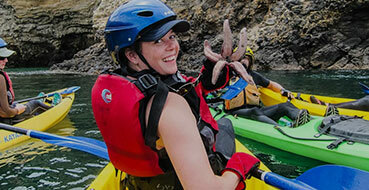 Come explore Channel Islands National Park with the Channel Islands Adventure Company! We’ll spend a half-day exploring the sea caves around Scorpion Anchorage on Santa Cruz Island. No other area of the park offers as many sea cave kayaking opportunities. Book a tour online using the coupon code: MOMSROCK before Mother’s Day for our Discover, Adventure or Ultimate Sea Caves tour and you’ll receive 10% off. Coupon good for all sea caves tours before June 15th. (2) Discover Santa Ynez Wine Country by Sprinter Van or Bike! Join us on Sunday, May 13th to cheers mom on a wine tour! We’ll visit three local wineries and have lunch in the Santa Ynez Valley. Groups often enjoy a barrel room tour and explore the small town of Los Olivos. Your guide will discuss local history and insights into the Santa Ynez wine region along the way. Book a tour online using the coupon code: MOMSROCK before Mother’s Day for any of our wine country tours and you’ll receive 10% off. Coupon good for all wine tours before June 15th. Why not hike to Inspiration Point with someone who has been an inspiration in your life? The hike is only 3.5 miles with an elevation gain of 800 feet and offers incredible views of the American Riviera. There are also some great hiking opportunities on Santa Cruz Island in the Channel Islands National Park. Pssst: Mom wants you to pack some snacks for the summit! More information on the here. Explore Ecology will be hosting an Arroyo Burro beach clean-up on Mother’s Day from 12-2pm. Meet at the Watershed Resource Center at Arroyo Beach just before 12pm. If you like, bring your own bag, bucket, and gloves. If you don’t have them, they’ll have supplies. You can find more details here. Join in the family friendly fun and decorate your bike to join the parade. Prizes will be awarded for family themes, best bike decorations & more! Goodies will be available for moms. The action will be taking place at the Paseo Nuevo Mall at De la Guerra St. at 2pm. For more information visit here. The annual Carpinteria Artists Studio Tour takes place each May during Mother’s Day Weekend. Join for the inside scoop when dozens of local professional artists open their doors for a glimpse behind the scenes where the creative experience unfolds. The event is from 10-5pm and is free to the public! More information here. Learn about the Mission’s architecture, beautiful artwork, and view some of its greatest treasures in areas not normally open to the public.Tickets are $20 per person and space is limited so call 805-682-4713, ext. 166 or email museumtours@sboldmission.org to book. Don a hat this Sunday from 2:30-5:30pm and to join in the fun on Mother’s Day at the Santa Barbara Polo & Racquet Club! Tickets start at $10 and can be purchased online. Don’t miss the “Overtime Party” a social after-party beginning immediately following the trophy presentation at Sunday Polo in the main clubhouse and on the field where guests can enjoy dancing and live entertainment. End the evening celebrating mom with a beautiful sunset backdrop. Our Harbor Sunset Kayak is the perfect surprise for mom before or after dinner. The trip includes 2 hours on the water paddling around as you learn about marine ecology and local history. It’s a great way to end a full day of celebrating mom. Book online or call our office (805) 884-WAVE. No matter how you decide to celebrate the incredible women in your life, we hope you have a wonderful time together making memories. Happy Mother’s Day to all mothers near and far. If we missed any great ideas for celebrating mom outdoors in the local area drop us a comment!